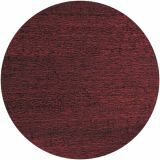 3/4" furniture-grade wood with stain- and scratch-resistant finish. Storage shelf has grommet cut-out for cable routing into lower cabinet. 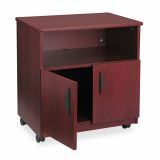 Mobile machine stand with open compartment is constructed of furniture grade particleboard with laminate finish has two doors with black pulls and four casters (two locking). 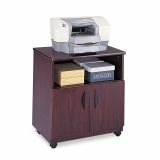 Safco Laminate Machine Stand w/Open Compartment, 28w x 19-3/4d x 30-1/2h, Mahogany - Mobile machine stand is ideal for all office equipment including TV/VCR setups. Double doors conceal lower compartment 26" wide x 17-3/4" deep x 14-3/4" high. 9-1/8" high upper compartment is partially open in back for cable routing with a shelf that adjusts in 1-1/4" increments. Includes four swivel casters (two locking). 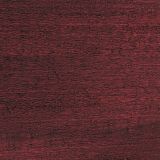 Made of tough 3/4" furniture-grade particleboard with laminate finish and 80 percent recycled wood. Machine stand holds up to 200 lb.